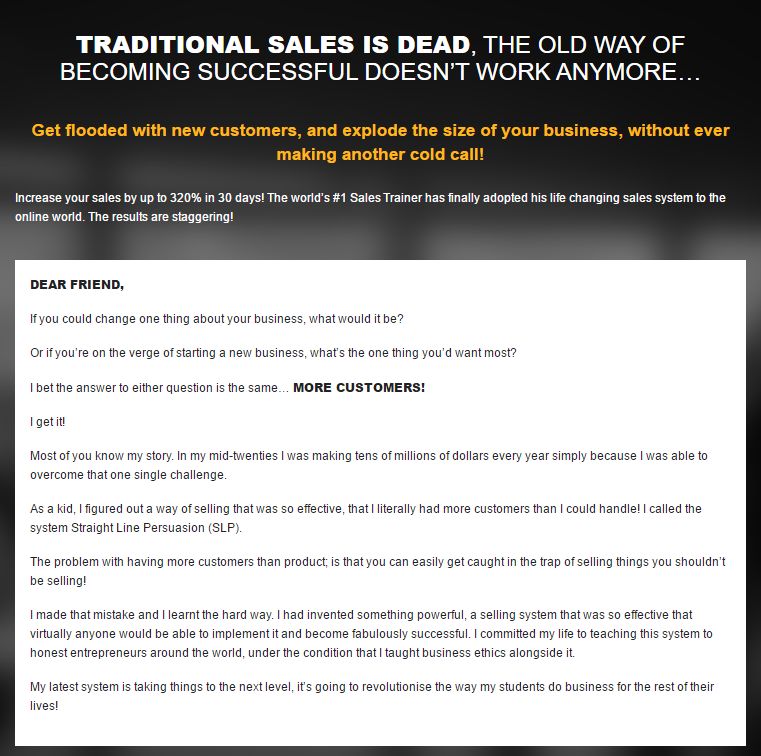 Get flooded with new customers, and explode the size of your business, without ever making another cold call. By the time you’ve completed this program you will literally be a more effective entrepreneur than you’ve ever dreamed possible. You’ll have more customers than you can handle and you’ll be living the kind of life that you deserve to be living. Or if you’re on the verge of starting a new business, what’s the one thing you’d want most? I bet the answer to either question is the same… MORE CUSTOMERS! Most of you know my story. In my mid-twenties I was making tens of millions of dollars every year simply because I was able to overcome that one single challenge. As a kid, I figured out a way of selling that was so effective, that I literally had more customers than I could handle! I called the system Straight Line Persuasion (SLP). The problem with having more customers than product; is that you can easily get caught in the trap of selling things you shouldn’t be selling! I made that mistake and I learnt the hard way. I had invented something powerful, a selling system that was so effective that virtually anyone would be able to implement it and become fabulously successful. I committed my life to teaching this system to honest entrepreneurs around the world, under the condition that I taught business ethics alongside it. My latest system is taking things to the next level, it’s going to revolutionise the way my students do business for the rest of their lives! Ever since they made a wild movie about my life, and the ridiculous sums of money I was able to make, I’ve been bombarded by fortune 500 companies and top entrepreneurs wanting to learn my system. I continued to teach it to people, under the condition that it was always implemented with ethics! No surprise they all made fortunes! I’ve literally created more millionaires than any other sales trainer that’s ever lived. That’s something I’m incredibly proud of! But there’s a catch! The world is changing fast! I always knew that the information age is going to change the way we do business. If you can’t keep up with the changes you’re going to be left behind! Adapt or die! The one thing my students could never understand was that SLP is a philosophy. It’s based on the laws of persuasion. To succeed in this new world all you have to do, is adapt the same LAWS to the online world! I put it to the test. I was consulting a successful digital marketing agency in Australia. I taught the owners Straight Line Persuasion and explained how they could implement the entire philosophy to their campaigns. They implemented everything I taught them and they were BLOWN AWAY! Their average campaign performance went up by 320%!! They were so shocked by the results that they couldn’t contain their excitement. I started working closely with these guys and decided that they would be the perfect team to show the world how SLP coul be used online to literally crush your competitors and take your business to a level you didn’t think was possible! That’s how I created Straight Line Marketing. By the time you’ve completed this program you will literally be a more effective entrepreneur than you’ve ever dreamed possible. You’ll have more customers than you can handle and you’ll be living the kind of life that you deserve to be living! REMEMBER: REAL REWARDS ARE RESERVED FOR ACTION TAKERS! I remember reading the story of an early partner of Jeff Bezos who exited Amazon with a payment of $500! He must still be kicking himself! Firstly, I practice what I preach! When I teach you the value of taking action and seizing opportunities QUICKLY, I mean it! What better way to get that message across, than by rewarding the students of mine that actually DO take action! Secondly, ‘Inner Game of Wealth’ and ‘Script Builder’ compliment Straight Line Marketing perfectly! Think about it. If you have the mindset (Inner Game of Wealth), the sales skills (Script Builder) AND all the leads/potential customers that you can handle (Straight Line Marketing) what can possibly stop you? ?